Jim would like to know why the train is called The Fying Scotsman. Jim explains that it is an LNWR official name. At the time the other Flying Scotsman did not exist and the title had not been used by the LNER/GNR for a loco or train. So what seems like a mystery to us was not so to whoever used the name for the LNWR card. It would be nice to know what the stock is on the train and what the train itself is - whether it is a Scotch Express as the LNWR would have called it or not. 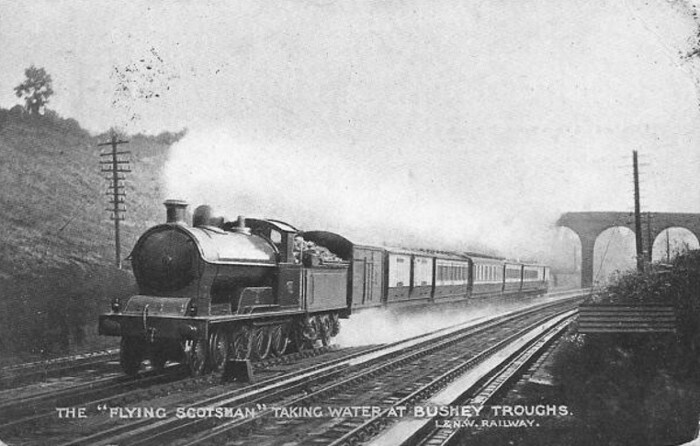 The loco is one of George Whale's Experiments and the train is on the up fast line at Bushey troughs. As the sun is nicely ¾ on to the train, it must be a morning shot, so it is perhaps an overnight train, wherever it has come from. This is one I have always seen as a bit odd. The card is a London & North Western official issue so presumably must have had the blessing of the publicity department although I cannot recall any other official reference to the name by the company. There were two issues of the black & white card circa 1907 and two coloured, 1909-10 so the name was used on cards for several years. I think it will always remain an enigma. The cover of the June 1907 L&NWR catalogue of official postcards shows an almost head-on Precursor climbing Camden bank captioned: “L&NWR Express The Flying Scotsman”. Where the term “Flying Scotsman” originated I do not know; possibly it was inspired by the GWR “Flying Dutchman” train, but it seems to have been in unofficial use on the GNR from the 1870s. A Board of Trade accident report of an accident in August 1873 refers to the GNR 10 o'clock train as the “Flying Scotchman”. W.M. Acworth writing in 1889 calls it “the famous Flying Scotchman” and “Flying Scotchman” is used by the Locomotive Magazine in the late 1890s when referring to the GNR train. So maybe, as the term wasn't official, the L&NW simply pinched it, perhaps changing the spelling in a cunning plan to appeal to those Scots who (for whatever reason) have an objection to the word “Scotchman”. The train consists of 21ft CCT, 45ft 0in BG, 50ft 0in TK, 65ft 6in Sleeping Car, then two more 50ft 0in corridor carriages and another brake van. Looking at the 1910 Marshalling Circular, could well be the combined 11/55 from Liverpool and 11/55 from Manchester. But this would be due into Euston at about 5.00am. The train does not seem to be a Scotch express. Was the name “Flying Scotsman” inherited from a stagecoach, perhaps largely forgotten until the LNER revived it in 1923? This picture makes reference to the 'Flying Scotchman'. It depicts the train having had an accident at Heeley (MR) in 1876. I think the picture owes a lot to artistic licence. The date of the accident is said to be 21/11/1876 but I can find no trace of this in the railway accident reports. It begins to look as if any fast train to Scotland, on any line, could be described as 'The Flying Scotchman / Scotsman'. I think Philip has probably found the origin of the name with his suggestion that it may have been that of an old stagecoach. The Midland Railway accident at Heeley on November 21st 1876 is listed in John Dixon's index to the Board of Trade reports as a derailment. E.G. Barnes in The Midland Main Line 1875-1922 says the train was the 9-15pm overnight Scotch Express from St. Pancras. It was travelling at 60mph when (at 1am on November 22nd) vehicles at the rear of the train were derailed by a track defect, but the new Westinghouse Automatic Brake brought the train to a stop in only 20 seconds. Amazing, if true!